The image on the top is from a mouse that is normal. The image on the bottom is from a mouse treated with chemotherapy. 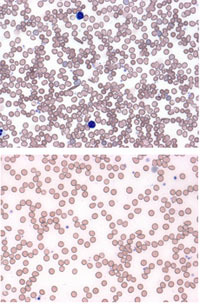 The two blue cells are white blood cells; the red cells are red blood cells. Using a novel technique to analyze simultaneously large numbers of microRNAs in living mice, scientist at Yale University identified and disabled miR-150, allowing mice to more efficiently regenerate white cells and platelets depleted by chemotherapy. Chemotherapy kills blood cells as well as cancer cells, often with fatal results. Now Yale stem cell researchers have identified a method they hope one day will help cancer patients undergoing chemotherapy maintain a healthy blood supply, they report in the Oct. 18 issue of the journal Cell Reports. The team, under the direction of Jun Lu, assistant professor of genetics at the Yale Stem Cell Center and Yale Cancer Center, studies how blood cells regenerate. Lu is particularly interested in roles played by tiny bits of genetic material called microRNAs in the production of blood and the function of blood stem and progenitor cells, which help determine the type of blood cell created. Chemotherapy kills these types of progenitor cells, making it difficult for blood to regenerate. While red blood cells can be replaced by transfusions, white blood cells and platelets often do not recover well, leaving cancer patients prone to infections and bleeding. Using a novel technique to analyze simultaneously large numbers of microRNAs in living mice, the researchers identified several that are involved in blood formation. When they disabled one of these microRNAs, miR-150, they found that mice were able to more efficiently regenerate white cells and platelets depleted by chemotherapy. Mice without this microRNA showed no ill health effects. Conversely, mice with active miR-150 had difficulty generating new blood cells. “We hope that finding specific microRNAs involved in blood formation will provide us ways not only to help cancer patients survive chemotherapy, but to make chemotherapy more efficient,” Lu said. Other Yale authors of the study include Brian D. Adams, Shangqin Guo, Haitao Bai, Yanwen Guo, Cynthia Megyola1, Jijun Cheng and Kartoosh Heydari. Researchers from The Scripps Research Institute, Mount Sinai School of Medicine, and Shanghai First People’s Hospital also contributed to the study. Be the first to comment on "Disabling MicroRNAs Allows Mice to Regenerate White Cells and Platelets Depleted by Chemotherapy"